The Rhetoric and Public Writing minor is designed for students who want to distinguish themselves as excellent writers in whatever professional or community roles they may play. Students in this minor learn how to apply the analytical tools of a liberal arts education to community and workplace settings. The core courses teach ways to research and write thoughtfully, ethically, and strategically. Class projects and internships help students build their professional networks and gain résumé-building experience. Electives deepen and enrich students’ knowledge base with related courses in other programs. Discovering the timeless, essential concepts behind effective composing helps students not only be successful writers today, but also sets them on a path to be even better writers ten years from now. Student projects and internships help build professional networks and gain résumé-building experience. 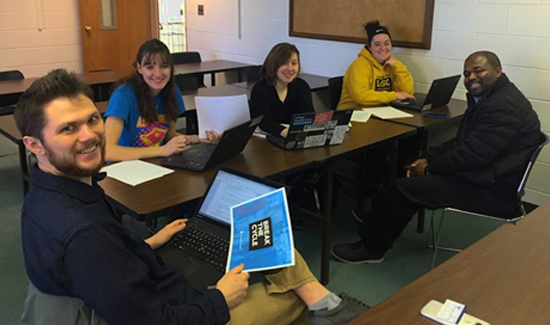 Loras students collaborate with a community partner as they prepare to write a grant proposal. 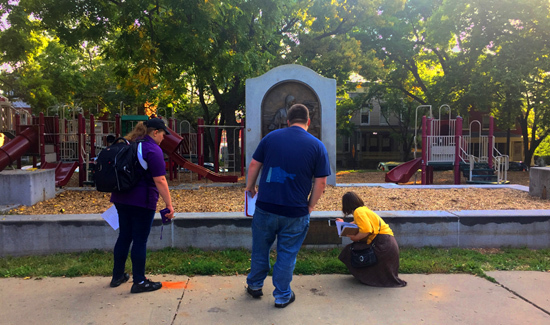 Students learning about visual rhetoric and analyzing how history is represented in the monuments and memorials at a local park. 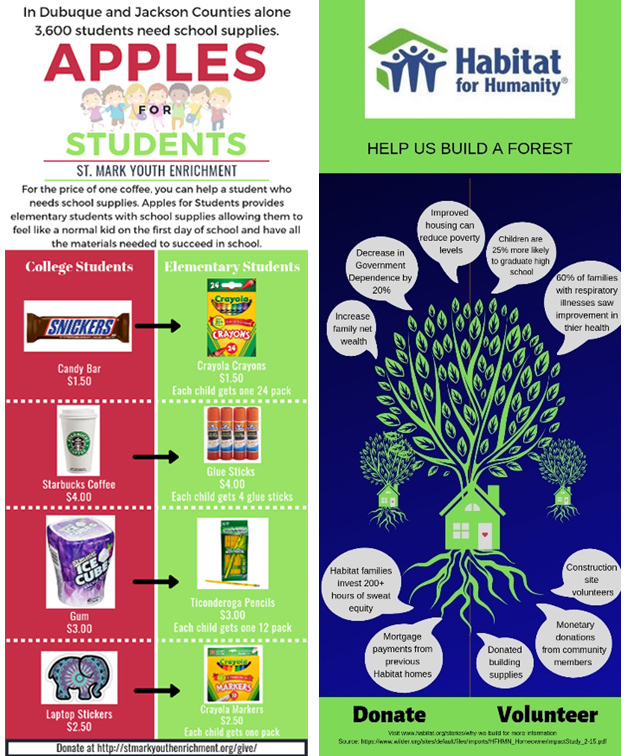 Infographics that student groups developed for community partners. Students completing the Rhetoric and Public Writing minor will successfully undertake a three credit internships at a site such as a non-profit or civic organization, a government office, or a business where they will apply concepts learning in their coursework to meet the needs of the broader community. Internship activities might include writing grants, designing informational materials, composing correspondence, editing documents, producing web content, or similar projects. Students should contact the Loras College Center for Experiential Learning to pursue internship possibilities. This course surveys the field of rhetoric (the study of argumentation), observing how these long-revered concepts come to life in political rhetoric of the twenty-first century. Prerequisites: L.LIB-105 or L.ENG-111. 3 credits. In this course students explore and learn the complex process of securing funding for non-profit organizations. Students gain actual experience in grant writing through partnerships with community organizations. Prerequisites: L.LIB-105 or L.ENG-111. 3 credits. This course focuses on concepts of effective online writing. Although specific writing platforms (websites, blogs, social media, etc.) change constantly, these concepts prepare students to adapt to these changes thoughtfully, ethically, and strategically. Prerequisites: L.LIB-105 or L.ENG-111. 3 credits. In this course students learn how to apply rhetorical concepts to community needs by partnering with local organizations on projects related to social justice, civic engagement, and public dialogue. Prerequisites: L.LIB-105 or L.ENG-111. 3 credits. An introductory creative writing class focused on the short story. The class is conducted as a workshop/seminar of approximately 15 students, with heavy emphasis on student- composed fiction. To complete the course, students must write three short stories for a cumulative total of at least 25 final pages, participate actively in class, and critique other students’ work in writing. Prerequisites: L.LIB-105 or L.ENG-111. 3 credits. An introductory creative nonfiction workshop course specifically focused on the Midwest landscape. Students will write, workshop, and revise two works of creative nonfiction, including one memoir/narrative and one literary journalism essay. In addition, students will read published works of creative nonfiction, write literary analyses focusing on techniques of creative nonfiction, participate in three required local winter hikes/photography shoots, and deliver a photo-essay presentation involving a reading of their creative work with a backdrop of digital photography. Prerequisite: L.LIB-105. 3 credits. January term. An introductory level workshop in which students write and receive feedback on creative nonfiction essay forms. Students also analyze the writing techniques of published authors. Editing workshops focus on stylistic polish. Prerequisites: L.LIB-100, L.LIB-105, L.LIB110, and one course from L.LIB-130, L.LIB-135, or L.LIB-220. 3 credits. An advanced-level workshop course in nonfiction nature writing. Students write in various sub-genres of creative nonfiction, and also study technique and theme in contemporary nonfiction nature writing. 3 credits. An advanced-level workshop in which students write memoir, meditative, and literary journalism essays while analyzing the works of published authors. 3 credits. An advanced course in the art and craft of writing fiction. Prerequisite: L.ENG-237 or equivalent. May be taken twice. 3 credits. An advanced course in the art and craft of writing poetry, intended for students with strong backgrounds in reading, writing and critiquing poetry. Prerequisite: L.ENG-238 or equivalent, or permission of the instructor. May be taken twice. 3 credits. An advanced workshop seminar devoted to a detailed study of writing style, grammar and mechanics, based on original and extensively revised student work. Prerequisites: LIB 105; at least one (1) 200-level writing class, one (1) 300-level writing class highly recommended. 3 credits. January term. This course combines the basic techniques of creating and manipulating images in a digital format through digital photography and Photoshop software. 3 credits. A fundamental skills course in writing, editing and designing materials for use in public relations. For students majoring in public relation, the program requires a minimum grade of B- in this course. Prerequisite or concurrent: L.LIB-105 or ENG 111. 3 credits. A review of the classic and contemporary perspectives of organizational communication, including cultural and critical approaches. This course also explores organizational communication processes such as decision-making and conflict management. Prerequisites: L.COM-190 or concurrent enrollment. 3 credits. Hands-on examination of the process of telling journalistic stories through photography. Includes work in interviewing, topical research and image composition. 3 credits. January term or offered as needed. Principles and theories of design and layout used in developing a variety of publications. Includes typography, graphics, and copy fitting. Emphasizes computer-assisted publishing based on page layout and graphics programs. Students must demonstrate computer competency. Open only to public relations majors and minors. 3 credits. This course is a basic introduction to the primary features of the American political system, examining such things as the Constitution, elections, public opinion, parties and interest groups, the media, Congress, the presidency, the courts, and civil rights and liberties. Woven throughout the course is an exploration of some of the most pressing issues in contemporary American politics. 3 credits. Fall semester. This course introduces the major problems confronting the international community and that community’s efforts to address them. The focus is on common global issues such as globalization, nationalism, human rights, war, economic development, poverty, the status of women, and the environment. 3 credits. Spring semester. This course examines the nature of political campaigns and elections in the United States, with particular attention to presidential and Congressional elections. 3 credits. Fall semesters in even numbered years. This course provides students the opportunity to both study and participate in the Iowa caucuses. Students will examine the issues, voters, interest groups, campaigns, and candidates. Through direct observation of the campaigns and candidates, and the collection of campaign artifacts students will analyze political tactics and decisions, as well as the electorate. As part of the course students will choose what party to caucus with and ultimately which presidential candidate they support by caucusing for that candidate on election night. 3 credits. January term. Through a hands-on simulation, readings, class discussions, guest speakers, and media presentations, students will gain a foundational knowledge of the history of the working poor in the U.S., the theories regarding causation and reduction, and the grassroots efforts for change as they relate to the social class referred to as the working poor. Students will build on this foundation by developing a specific knowledge of the working poor in the Dubuque community. 3 credits. January term. The primary emphasis in this course is on introducing and exploring important issues related to race and ethnicity in the United States. The course analyzes information comprehensively and includes historical evidence in order to better understand culture. Students will explore probable causes and consequences of inequality rooted in race/ethnicity. Students will incorporate an analysis of values, including understanding how personal and cultural values result from social forces and structures, into their examination of race and ethnicity. Prerequisites: L.LIB-100, L.LIB-105, L.LIB-110, and one course from L.LIB-130, L.LIB-135, or L.LIB-220. 3 credits. Consideration is given to a number of contemporary social problems. Sociological principles are employed in the analysis of such topics as poverty, crime, racial and ethnic relations, health care issues, sexism, environmental degradation and other types of inequality. 3 credits. The primary focus of this course is the examination and application of social movement theory. Students will examine factors that influence movement emergence, culture, tactics, organizational strength, and outcomes. In doing so, they will assess the relative strength and weaknesses of social movement theory as they apply to a range of both progressive and conservative movements. Prerequisite: L.SOC-101 or L.SOC-115. 3 credits. Taught in English. This community-based learning course will examine the use of asset mapping as a tool for promoting and creating community action in Latino population centers across Iowa and within Dubuque. Issues of class, race and gender identity are critical to the asset mapping process and will be analyzed in conjunction with the structure of community relations. Prerequisites: L.LIB-100; L.LIB-105; L.LIB-110; and one course from L.LIB-130, L.LIB-135, or L.LIB-220. 3 credits. If it involves writing, we’re here to help! The Writing Center, located in the lower level of the Loras College library, offers one-on-one sessions with trained tutors to assist students with writing projects. Tutors work with students from across campus on every stage of the writing process: brainstorming, pre-writing, drafting, revision, and polishing. To learn more email naomi.clark@loras.edu. or click the link below for additional details. Dr. Koch teaches creative nonfiction courses in the Creative Writing major, with a focus on nature writing and Midwest studies. His love for the outdoors carries over into his own writing, including his three published books: Skiing At Midnight: A Nature Journal from Dubuque County, Iowa; The Driftless Land: Spirit of Place in the Upper Mississippi Valley; and The Thin Places: A Celtic Landscape from Ireland to the Driftless. His work has been published in magazines like The North American Review and Big Muddy. In addition, he writes a monthly outdoors column for a local newspaper. Visit him online at https://www.kevinkochdriftlessland.net/ . Dr. Naomi Clark completed her doctorate in rhetoric and composition (with a minor in women’s and gender studies) at the University of Missouri in 2014. In addition to directing the Writing Center at Loras, Dr. Clark teaches courses in composition (College Writing) and public writing. Her composition courses introduce students to research about literacy, rhetoric, and the writing process in order to help students better adapt to the range of college-level writing that they will encounter during their four years and beyond. Her public writing courses include Rhetoric & Political Engagement, Writing for New Media, Grant & Proposal Writing, and Writing as Social Action. These courses prepare students to apply their liberal arts writing and research skills for the community beyond the college classroom. In line with her teaching, Dr. Clark’s research traces the circulation of political rhetoric related to family and social policy in the context of the twenty-first century’s network culture. Her writing appears in edited collections such as Circulation, Writing, and Rhetoric (edited by Laurie Gries and Collin Brooke) and Networked Humanities Within and Without the University (edited by Jeff Rice and Brian McNely). When not working, Dr. Clark enjoys travel, podcasts, farm-to-table food, and checking out piles of library books for her two young children.